Oh Lawd, have I got a bathroom for you to enjoy today. Check it out. This reno is actually two closets that were combined to add an extra bath for Anna over on AB Chao. That's what a little vision, and ingenuity will get you in design. Another bathroom! And, you know I love some black penny tile. It's calling to me I tell you. Every where I turn, it's there, beckoning. Hmmmmm. Doesn't say much for my social life does it? But, that's another post...that will never be written. Ha! Notice how tiny the sink is? Love it! They have sinks to fit into ANY space. Which is wonderful when it comes to older homes, where sometimes all you have is a closet to convert. Plus they're just so darn cute. Black penny tile. Great rug. 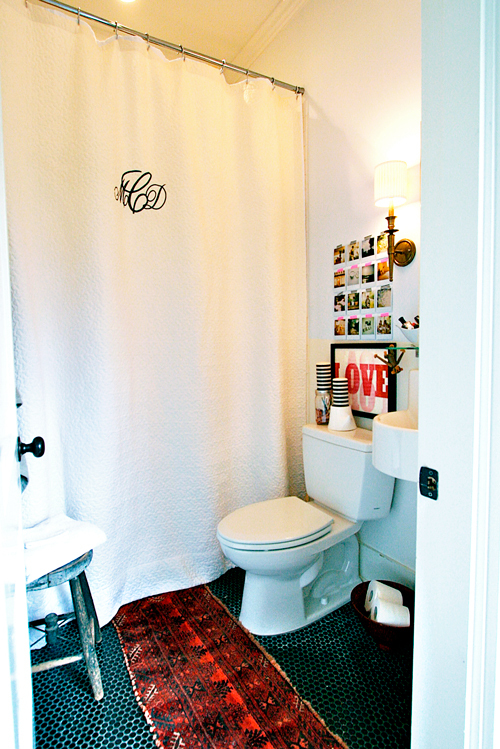 Monogrammed shower curtain. Well loved stool. All these things make for an interesting, personal, and unique space. 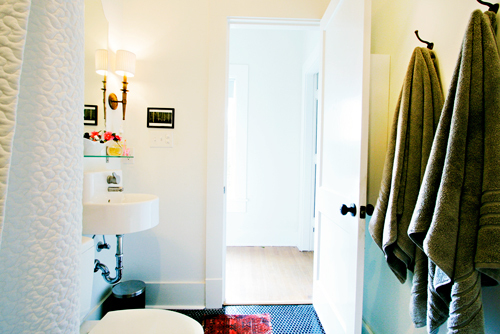 It seems like a lot is crammed in there for such a small bath, but it still feels open. People think that by filling a space it will feel cluttered. When in truth, it feels much more finished. It helps the room to hug you when you walk in. Now you minimalists out there may not agree, but for me, I like a room to be well rounded. Not crammed, but full. Isn't this a fab space? Well done! For more info/pics head on over there and check it out. Everyone have a wonderful rest of your day. I know I don't have to tell you what tomorrow is. that IS killer! especially loving those sconces. and have to agree on the black penny tile. and the rug. and interesting art display. OKAY - all of it! It looks great for such a small space! 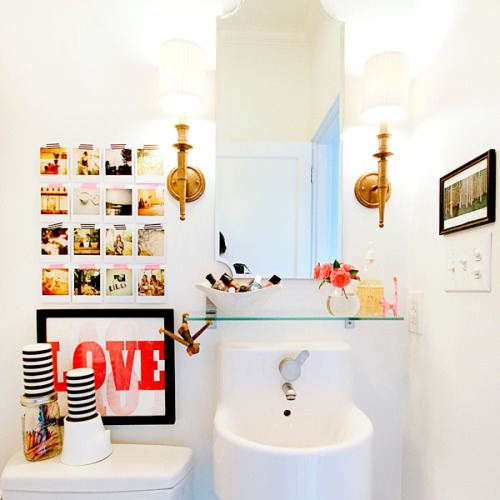 Love the sink and mirror too! I am obsessed!!!! The rug is super cool, I love the art and the Polaroids!!! Every detail is perfection!!! !